Hold the keyboard key Shift while selecting rows to highlight tasks. The highlighted tasks will be marked as completed. The highlighted tasks will be deleted and moved to the recycle bin. In the pop-up window, type in the name of the user of whom would like to transfer the tasks. Click Save changes & the highlighted tasks will be transferred. In the pop-up window, choose one of the following options: Tomorrow, Next Week, Next Month, or Specific Date. 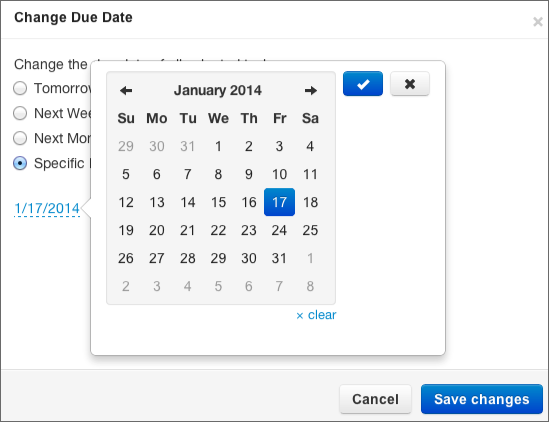 If you choose Specific Date a pop-up calendar will appear. Select the date and click the blue checkbox to save. Click Save changes & the highlighted tasks will be updated.